Blitz, Bow-Ties & Bourbon is a stylish evening of notable chef tasting, premium spirits, live entertainment, and live and silent auctions that benefit The Malcolm Jenkins Foundation’s youth programs and initiatives. Returning this year will be Luke Carlos O'Reilly and Black Tie Entertainment and also a special performance by Suzann Christine! Amy Fadool, Emmy Award winning sports anchor & reporter for NBC Sports Philadelphia will be the Emcee of the evening. 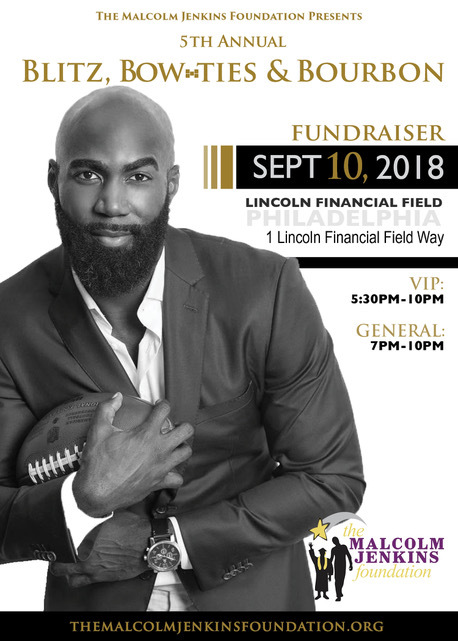 Philadelphia Eagles Super Bowl Champion, Malcolm Jenkins and his teammates will represent the home team in our mission to uplift Philadelphia’s young people. Will you join us? VIP Ticket, $325.00/per person, Admission 5:30 p.m. - 10:00 p.m. This is the ticket you need to get! - A custom tour of the 'Linc', a truly 'behind the scenes' experience. Each guest will be given a tour time upon check-in. - Access to our Lounge in the West VIP Club, which boasts a private Bourbon Lounge and access to the stadium. - An AUTOGRAPHED Eagles Logo Football by Malcolm Jenkins, #27 as soon as you arrive! You can then take this ball to all of the other players and alumni in attendance to get their signatures as well. - Access to the party almost hours before the other guests to sample bites from over 10 of Philadelphia's most inventive Chefs plus be first in line to sample the Bourbon cocktails that Malcolm has selected for the evening. - Finally, last but not least, a photo with the Super Bowl LII, Lombardi Trophy - only VIP guests will get this once in a lifetime chance! General Admission ticket, $200.00/per person, Admission 7:00 p.m. - 10:00 p.m.
At this level your ticket provides access from 7:00 PM until 10:00 PM for unlimited craft bourbon cocktails (and more!) plus delectable bites from Philly's finest restaurants. Visit with top chefs and enjoy pairings throughout the evening. The event also includes live entertainment, plus a silent auction and a LIVE auction. Join Malcolm and his teammates as we raise money for the Foundation! For our VIP package, only one personalized football is available for each ticket. Additional footballs are available for purchase at the event. No outside merchandise is permitted to bring into the event. The players will NOT sign anything other than a football purchased at the event. Founded in 2010, The Malcolm Jenkins Foundation helps youth in underserved communities realize a brighter future. Through programs and initiatives that emphasize education, character development leadership, life skills, health and recreation, we aim to empower youth to transcend the limits of their circumstance and reach their full potential.